(2:30 p.m. BST) -- In the second of her pieces following her world cruise onboard Fred. 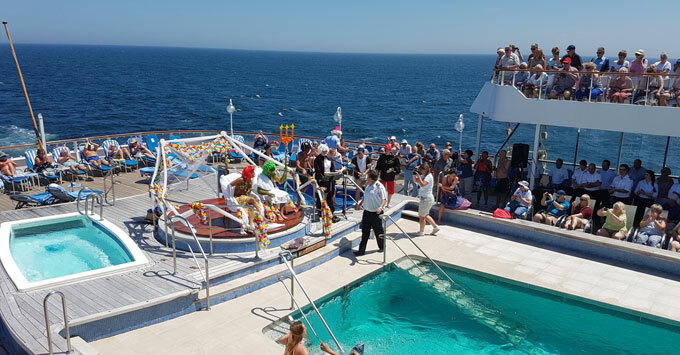 Olsen's Black Watch, Danielle reports on one of the classic ceremonies performed on ships when they cross the Equator -- as well as how confusing it is to lose time. The line crossing ceremony commemorates a sailor's first crossing of the equator, and it originally began as an initiation rite on merchant ships. In recent years, it has become increasingly popular on cruise ships, and passengers and crew are always excited to get involved. Those who have already crossed the equator are known as "trusty shellbacks," "shellbacks" or "sons of Neptune." Those who have not crossed are nicknamed "pollywogs" (another word for tadpole or baby frog) or "slimy pollywogs." It is the crew who undergo the ceremony (though passengers can participate). Ours featured "King Neptune" and a number of crew members from several departments. Each pollywog kneeled before King Neptune, his court and Her Highness Amphitrite. The latter is usually a man in drag, and on Black Watch, that job fell to one of the men from the entertainment team. King Neptune was also a member of the entertainment team, but it can vary by ship. Sometimes it’s the Captain or another senior officer. Once kneeled before the court, each endured an embarrassing monologue that was read out to everyone on the open decks by our cruise director. The reading usually pokes fun at each individual crew member based on his or her department. For example, being thrown face first into the pool is obviously a health and safety nightmare for our security officer and I’m sure our hotel director wholly embraced the digs about the beds being made twice a day. Each reading is specific to the individual, and that’s what makes it so hilarious. Once each individual was told of his/her punishment, he had a choice: either kiss her Highness and avoid the pool, or kiss a fish and be plunged into the depths. Everyone chose to kiss the fish -- and take a swim. The selected crew members don’t really have much choice to opt out when it comes to these ceremonies; there have been many before them that have undergone the same punishment after all. 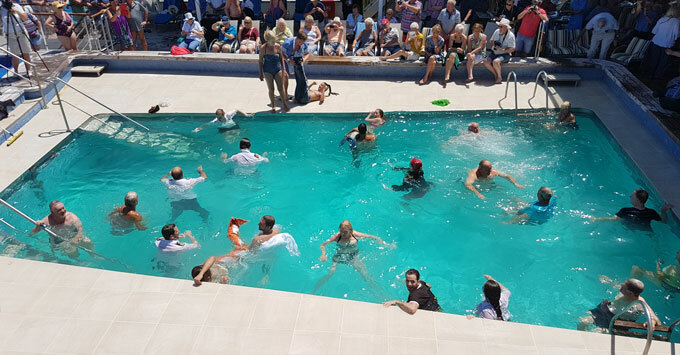 Although it is usually only the crew on most cruise ships that undergo the initiation, passengers were invited on Black Watch to step up, kiss the fish and then be thrown into the pool -- and around 20 passengers did. We crossed the International Date Line on a Saturday, skipping Sunday and going straight into Monday. I have a hard enough time as it is keeping track of the days and time zones when on a cruise, but this change confused everyone for a short while. We went from being 11 hours behind the UK to 13 hours ahead, within a split second. We were, if only for that one day, time travellers. The International Date Line was established in 1884 at the International Meridian Conference in Washington D.C. Japan, Brazil, Russia, Spain, Great Britain, Denmark, France, Costa Rica and the U.S., among others, were involved in its creation -- in all, 26 nations represented by 41 delegates. The line passes through the mid-Pacific Ocean, following a 180-degree longitude north-south line across the earth and separates two consecutive calendar dates. Cross to the west, and it is one day later; cross to the east, and you gain a day. One very interesting thing about the International Date Line is that it isn’t straight. It runs from north to south, but it zig-zags as it goes to avoid political and country borders, including eastern Russia and Alaska’s Aleutian Islands. It isn’t actually defined by international law, meaning countries are free to choose the date and time zone that they want to observe. As an example, in 2011, Samoa changed its time zone from UTC-11 to UTC+13 by simply shifting the dateline to the west and removing December 30, 2011 from the calendar. Tokelau soon followed Samoa and for the same reason -- to facilitate trade with New Zealand and Australia. We didn’t have a big celebration onboard to mark the occasion -- just some singing and dancing in the Neptune Lounge -- but each passenger did receive a nice certificate to say that we crossed the International Date Line and "lost" the 18th of February during the voyage. The concept of time on a world cruise is incredibly confusing, but it’s all part of the experience. Most of the time we barely know what day it is never mind what time it is. The one thing that we are all sure of, however, is when at sea, we know when it’s lunchtime because our Captain offers his noon report.